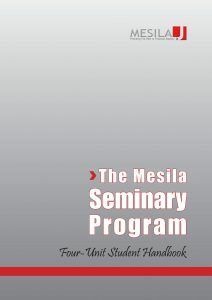 The Mesila Seminary (religious college for young women) Program teaches Jewish attitudes to financial responsibility as well as practical guidance for managing home finances effectively. The program emphasizes the importance of prioritizing, and gives students the tools to make wise lifestyle choices and withstand the pressures of consumerism. Building on the success of the original Hebrew program, the Helen Lee Seminary Program* was established as an English language study program for overseas students studying in seminary in Israel. * This program was made possible by the Lee Family of London, in memory of Mrs. Helen Lee Mrs. Helen Lee of London, England, who passed away on 24 Cheshvan 5770/Nov. 11 2009 , was a devoted wife and mother who was very involved in Jewish causes. In spite of her busy schedule, she gave unstintingly of her money and energies to benefit the poor, the ill, and the underprivileged. Deeply attached to Israel, she worked tirelessly to improve the lives of its citizens. In her own life, Mrs. Lee was a paradigm of financial responsibility, carefully prioritizing her spending and teaching her children to do the same. The generations of financially stable homes that will be built as a result of the Mesila Helen Lee Seminary Program are a fitting tribute to the memory of this exceptional woman.